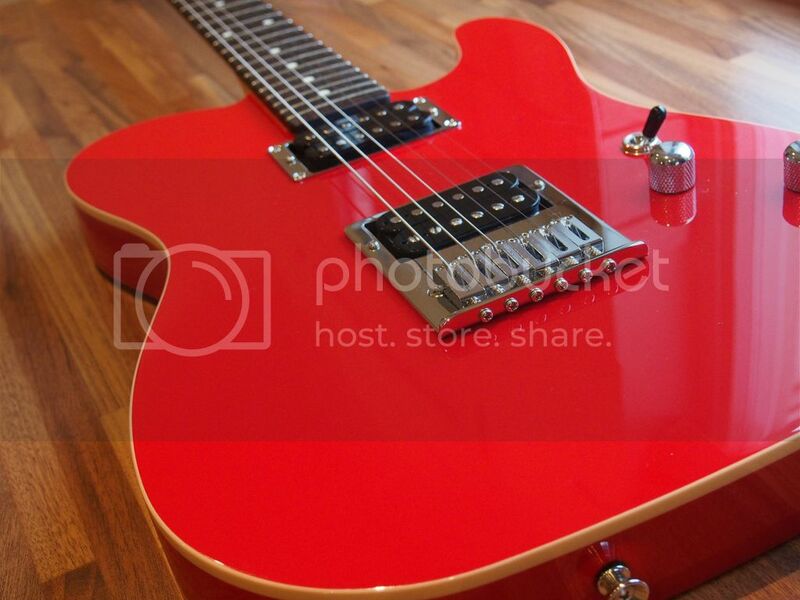 I bought it two years ago new and sight unseen from Thomann. It was going for a decent price (around £1300 from memory), so I took a punt knowing that I could send it back if I didn't like it. Up until this point I had really struggled to bond with a humbucker equipped guitar. I had owned various ranging from cheapies to top end stuff, and at the time had just given up on a PRS McCarty and was really wondering where to go from there and maybe give up on humbuckers altogether. I had just found them all a bit closed and muddy, lacking in articulation, and a bit generic sounding. But I still liked the bite, the compression and the fullness of tone for certain things. I was attracted to the PT as it had some of that California Custom Shop vibe I liked without it being a shred machine. Townsend was also a big influence early on so there must have been an element there too. There was one glowing (no really!) review from Guitarist magazine to go on, that was it, USA Schechter's weren't (aren't) exactly rife in the UK. So a bit of background: Schecter have obviously for the past 20 years or so been most known for their far eastern metal/rock (and often rather blingy) guitars. Absolutely of no interest to me, but I have always been aware of their origins as a high end parts and then fully-built guitar company and one that both Tom Anderson and John Suhr worked at in their early careers. Obviously the new outfit was far different, but Schecter set up a new USA shop in late 2012 that was to concentrate on producing a range of USA built guitars that had more than a nod to these early days. Well in truth the Schecter custom shop always still existed through the nineties and noughties but it was just one master builder who would make anything anyone wanted, for example he made Princes "symbol" guitars. I started to explore - was this new expansion just an outsourcing and marketing initiative or something with more integrity. After reading a few bits and looking at some detailed youtube videos of the new shop it was clear that this was the real deal - a dedicated and passionate small team building from wood blanks upwards and knocking out only around 30 guitars a month. From opening the case I immediately loved the vibe of it. I mean it could hardly be simpler, a slab alder body, maple neck with rosewood board and two humbuckers. Not a lot to get wrong, but everything about it just felt straight out of the top-draw. The paint finish was flawless, and despite not being my preference for Nitro, had a vibrant yet not dipped-in-plastic feel to it. The neck joint was spot on, the rosewood was a lovely dark even piece with heavily rolled edges, and to this day it is the best fret-job of any guitar I've owned, and possibly any guitar I've played. One thing to say, I bought this guitar from Thomann in late 2014, yet the serial number dates it to a January 2013 build and guitar number 4 to have come out of the new Custom Shop - so the poor thing had been sitting around for a while! The neck is slimmer than I would usually go for, it's a C carve and approx. 21mm at the 1st fret and 22mm at the 12th, so there isn't much taper. That combined with a 14" radius board and you could certainly shred on this guitar. But - it feels just as good banging out first position chords as it does doing stuff at the dusty end, it's incredibly easy to play but doesn't promote gymnastics as much as the dims would suggest, just feels very very comfortable for all types of playing. Weight is around 7.5 lb mark, which is perfect for me. Plugged in, this guitar as it came was bright bright bright, it could seriously have taken your head off. But, in all that it was an incredibly open sounding guitar, and backing off the tone control a little and it had a complexity and nuance to it that was missing from the other HB guitars I had owned. In summary it had something about it. I did however, want to experiment with other pickups in it so after some deliberation I fairly quickly changed the original set to Seymour Duncan Whole Lotta Humbuckers. Here's an oddity - the spec says that it should have been Schecter Super Rock Vintage pickups in it, but only when I swapped them out did I find they were Schecter Pasadena's - which is their vintage-hot PAF a-likes. I guess my guitar was such an early one the specs where a little more "loose". Anyway in short the Whole Lotta Humbuckers have been in the guitar ever since with no desire to change them. These pickups gave it a little taming of the high end, a little more midrange grunt but kept all of the openness, dynamics and articulation that I loved about it. It's a still a bright and cutting guitar, but can do the fatter humbucker stuff with the tone dialled back just a notch. It covers a huge amount of ground and these pickups suit it perfectly. There is a coil tap on both pickups that can be activated by pulling the tone knob, but I rarely use it I've never really got on with coiled tapped humbuckers TBH. 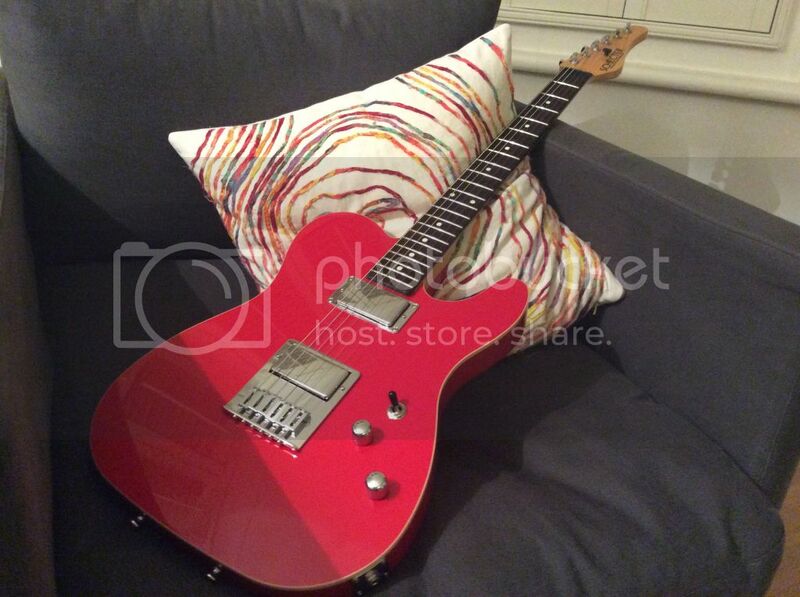 So two years on and this single-coil devotee probably reaches for this guitar more than my "no-1" Strat. It just feels so easy to play and is so simple yet versatile whilst still having a personality of it's own. Conclusion then - you've probably guessed that I rather like this guitar. I'm not one to shy away from a left-field choice of guitar, and this time it paid off - I find a few passionate people in the Schecter Custom Shop endlessly more interesting than what Gibson have tweaked on their Les Paul for the latest model year, but that's just me. It has had me thinking at times as to what I would change to make my (on-paper) perfect guitar - the wood combo and the Tele shape with twin humbuckers would stay for sure, just maybe a very slightly fatter neck, and a nitro (but non-realic'd) finish. But as we all know, it just doesn't work like that - these few specific bits of wood glued painted and bolted together make for this specific instrument, and it's a belter, so no messing! That's a lovely guitar, I remember a singer in a band i used to be in around 2000 bought a high end schecter a S/S/H That was a great guitar, a lot more in common with a Tom Anderson or a Suhr. I vaguely remember him paying £1700 for it. I would love to change my username, but I fully understand the T&C's (it was an old band nickname). So please feel free to call me Dave. Schecter guitars are amazings ! !, but I dont know they manufactured telecaster models. Enjoy it, is pretty ! The Schecter USA custom shop is amazing and such good value for money, really under rated. That's lovely and I bet it plays brilliantly. I had a PT Diamond Series and even that was excellent. This is gorgeous. Lazy player, doesn’t practice properly, slowly enough or sit down and learn the things that would improve my playing - and I obsess over new purchases. Like most of you, I imagine.